When you notice that there is a leak in your current gutter system, or that it is not draining efficiently, there may be an issue that needs to be addressed. Some of the minor issues that occur with rain gutters are easily addressed by diy gutter repair. If the problem is larger than you care to tackle, there are pros available to assist you with fast and courteous service. Depending on the amount of rain that falls in your area, the rain gutters on your home or business can help to prevent slick conditions on walkways and they can also help to preserve any landscaping that lies directly beneath them. Gutters help to redirect the streams of water that collect on the roof. Instead of washing away the ground below, they move down the system and drain through a downspout that allows the water to drain into a more convenient location. A small gutter leak can be repaired more easily than a larger one. It can also help in avoiding total gutter replacement costs. It is important to address any issues you find before they become major. If you have a gutter leak, repair it as soon as possible. Find the source and make any required diy gutter repair. It may be possible to patch small cracks and holes. If the damage is moderate, you may be able to successfully replace a section of the gutter with the same product type. If your rain gutters have been in place for a while, there is a good chance that some of the fasteners have weakened over time. Visually inspect the gutters for sags or evidence that it is beginning to pull away from the wall. If you see missing screws or rivets, replace them. This will help to keep your gutters firmly in place. Just one loose section can cause stress that will have a domino effect in pulling more sections loose. Even if the area of the missing fasteners seems secure, it is best to be on the safe side. 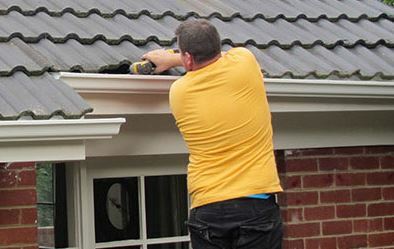 If the damage to your gutters exceeds your expertise or ability to make the needed repairs, then you may need to consult with a professional in the gutter repair industry. What to do if you need help If your gutters are beyond what you are able to do on your own, it is best to call in professional help. The experts at Hamilton Gutter Pros are serving the Hamilton, Ohio area and we offer a full range of services including: gutter installation and seamless gutter repair. We use premium rain gutter materials for durability and long life. We guarantee the satisfaction of our customers with fast and courteous service. If you need new gutters, gutter repair or replacement, we can help. Give us a call to discuss your needs and we can provide you with estimates on gutter replacement cost or on any other services that are needed.